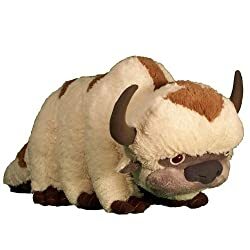 Appa Plush 18" This toy is amazingly fluffy. Like, so fluffy you could die. UNFATHOMABLY FLUFFY, IS ALL I'M SAYING. But everything changed when the fire nation attacked. He does not respond to basic commands and has shown no propensity to flight, not even when told &#34;yip yip&#34;. He isn't eating his food and can't swim. Due to his inability to perform such basic flying air bison functions, I dunno if it's worth spending more than $20 on.